What is a constituent relationship management software? 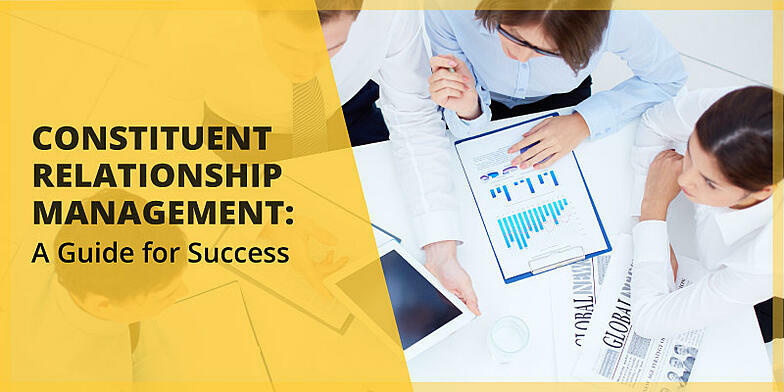 What types of constituent relationship management solutions are there? Do I need a constituent relationship management software? How do I start my search for a constituent relationship management solution? How do I fundraise with my constituent relationship management software? If you’re ready to master donor relationships, fundraising strategies, and more with a constituent relationship management solution, let’s dive in! 1. What is a constituent relationship management software? CRM, or Constituent Relationship Management system, is a popular nonprofit software used as a way to house constituent data in one centralized location. CRM software handles the approach and provides the tool, meaning this solution handles how nonprofits manage their relationships while providing the tool for easy management. Ultimately, CRMs were designed with nonprofits in mind to lift some of the administrative burden off the backs of organizations’ staffs and volunteers. Most nonprofits invest in constituent relationship management software to better organize their donor data. It’s as simple as that. Organized data translates to better donor relationships and more efficient outreach and fundraising strategies. CRMs basically give nonprofits 360-degree images of their donors, so the organizations can get to know their supporters inside and out. These profiles allow your organization to better cater your cultivation, communication, and fundraising strategies to specific donors. 2. What types of constituent relationship management solutions are there? It’s important to note that there are two fundamentally different types of CRMs: onsite and cloud-based. An onsite CRM is a traditional solution that’s installed on one computer, usually in a nonprofit’s central office. Onsite programs are great for larger nonprofits who have a bigger staff and more resources to maintain the software. Some organizations are required to use this type of constituent relationship management solution because it’s historically more secure than cloud-based programs. On the other hand, we have cloud-based CRM systems, which are easily accessible through any internet-capable device, like a cell phone, tablet, or laptop. This software is perfect for smaller nonprofits or organizations who are consistently on the go as it allows an organization to create different user accounts with different security levels. Plus, cloud-based CRM providers often provide mobile apps to make your donor management process even smoother! 3. Do I need a constituent relationship management software? In short, you most likely do. To really know if your organization can benefit from a constituent relationship management solution, you’ll need to do some soul-searching. 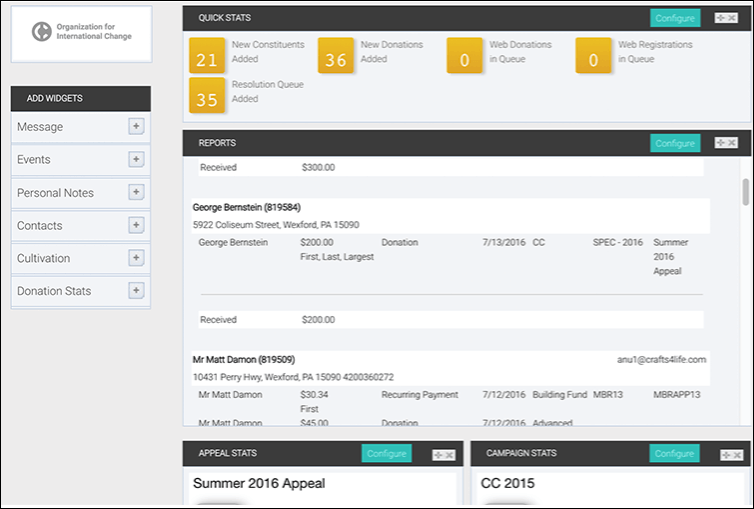 Because CRMs offer endless features for donor management, like constituent profiles, donation tracking, donor cultivation, member management, reporting, and more, you’ll need to determine what your needs are as a nonprofit. Take a look at how large your organization is. How many people are on your staff? Are you growing quickly? The bigger your organization is, the more powerful of a CRM you’ll need. Larger nonprofits often need more complex and sophisticated software that can handle the number of supporters they interact with. But be cautious: if you’re a smaller nonprofit, there’s no shame in that! Be sure you don’t invest in a software whose scope is just too large for you. You don’t want to be paying for a solution you’re not using. Instead look into scalable software, a solution that you can add onto and that will grow as your organization does! Look for a solution that accommodates all the individuals who need access. If your organization’s development director, fundraising consultant, staff members, and peer to peer fundraisers all need access to your software, a solution that only allows for 4 users won’t be sufficient. On the other hand, if only your organization’s leader and fundraising consultant will need access, then a solution with 4 users might even be too big! Make sure you size up your organization to your solution to find the right fit. Keep in mind what your nonprofit absolutely needs. What information do you want to record? Which data can help your better your strategies? For example, many smaller nonprofits like recording personal and custom information about their donors, like their pet’s name or any dietary restrictions. This information lets nonprofits then invite donors with pets to their next walk-and-paw-a-thon event or offer the most popular (and safe!) meals at their next gala. In the end, it comes down to offering their donors opportunities tailored to their interests. Nonprofits that make notes like these might say that custom entry fields to donor profiles are a must-have! If you’re already using any fundraising software, you’ll definitely need to make sure the CRM you invest in is compatible with your current solutions—unless you’re looking to give something up. Investing in a CRM that seamlessly integrates with your fundraising software means you won’t have to manually transfer any data, but can instead use all of your solutions like a team. As your online donation forms collect a new donor’s information, that data will be transferred to your CRM to create a new constituent profile. Sounds like a dream, right? 4. How do I start my search for a constituent relationship management solution? Do your research. It’s easiest to start researching constituent relationship management solutions online, but don’t forget to reach out to your peers to ask for help! Ask similar sized nonprofits with agreeable causes which providers they use. You’ll also want to take this time to create a budget for a solution. Keep in mind, you’ll want to save some room to grow so don’t under-budget! Get in contact. Give your top vendors a call. When you get in touch, your organization and the vendor can work together to determine if their software is a good fit for your organization. Try a demo. Submit a demo request on their website and try out their software. Now that they think their software could work for your organization, it’s your turn to confirm it! Test out a free trial. If you liked what you saw in the demo, ask the vendor if they offer free trials! Many providers offer 15 of 30 day free trials so you can test out their solutions with your latest campaign or even an event. Commit. Last but not least, sign a contract when you’ve found the perfect CRM for your organization! In just 5 easy steps, your organization can find a great CRM solution! 5. 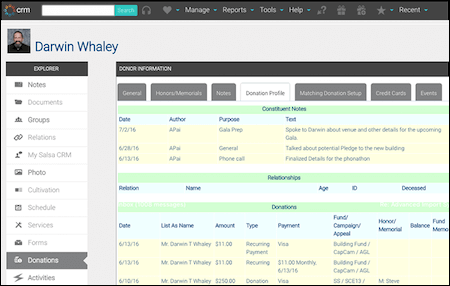 How do I fundraise with my constituent relationship management software? As mentioned, your constituent relationship management software comes with endless benefits, one of which is the improvement of your fundraising strategies! The following three are just a few examples of how your CRM can vastly benefit your organization. Matching gifts, for those who don’t know, are corporate programs where a donor can double their donation to your organization by submitting a request to their employer who will match their donation! Most companies match on a 1:1 ratio to full-time employees, though sometimes part-time employees and retirees are eligible. Some companies even match at better ratios like 2:1 and many have minimum and maximum donation requirements. You can log all your donors’ matching gift information in your constituent relationship management software and integrate a matching gift tool. This way, your donors can check their matching gift eligibility while filling out your donation form. Then you’ll know who’s eligible and be able to send matching gift-tailored content to the appropriate supporters. The more eligible donors know about matching gifts, the more likely they’ll be to submit the right paperwork to their employers! That translates to more donations for your organization! 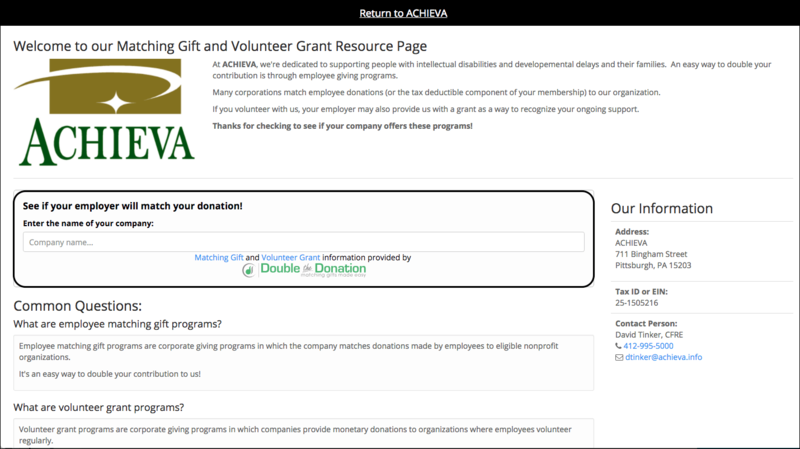 Salsa’s CRM integrates seamlessly with Double the Donation’s matching gift tools. With a CRM, you know your organization can store endless amounts of donor data. From contact information to their favorite sport, the options are limitless when you can create your own custom fields to track data that’s important to your organization. You’ll be able to store unique information in one centralized location to give you a holistic view of your supporters that you can leverage for upcoming campaigns and fundraising events. With these insights, you’ll be able to target your donors with information that’s appropriate and of interest to them! A strategic outreach will prove you value your donors and their preferences, all the while taking the time to really get to know them! Every CRM comes with different capabilities as well as integrations so you can focus on even more tailored content for your fundraising efforts. Prospect research is often one of these integrations that you can connect with your CRM. Think of what you could do if that information was connected to your nonprofit CRM! 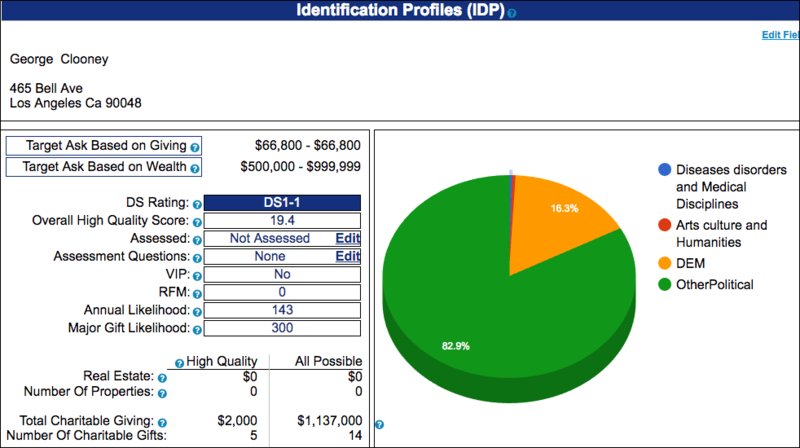 Once you've conducted your prospect research, the data you obtain could be easily transferred to your donor profiles. With Salsa, for example, you can integrate DonorSearch’s powerful prospect research tools to help you track major gift prospects, craft personalized outreach, and organize cultivation processes. Keep in mind, with more data, you’ll easily be able to find the donors who can give more! Remember that a CRM solution can only help your organization if you use it, but the investment in a constituent relationship management system will help your organization grow its fundraising and communication strategies while you get to know your donors better! Salsa’s Steps to Regain Lapsed Donors. Every nonprofit knows that lapsed donors, while unfortunate, are inevitable. Earn those donors back with our easy steps! Salsa’s Strategies for Donor Retention. Donor retention is a piece of cake when you have the power of a CRM on your side. Check out the best strategies for retaining donors. 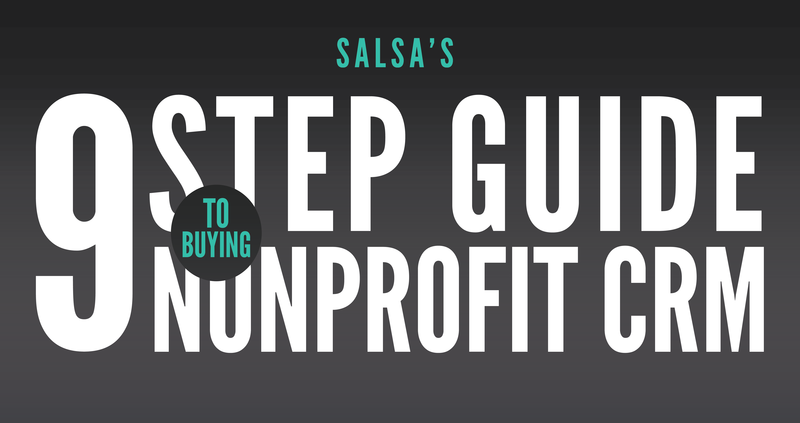 Salsa’s Best Practices for Donor Acquisition. Donor acquisition can be tricky. Where do you look for new donors? Check out our best practices for easy donor acquisition. We get it! There are tons of choices out there and buying software can be a daunting task. Use this infographic to develop a game plan for when you begin to ensure you satisfy all of your organization's wants and needs. For more information about fundraising and nonprofit CRM software, check out one of our helpful guides or view the infographic below.